I'm in complete denial that summer is over. At least, Oktoberfest is a nice way to ease in fall. I can drown my sorrows if need be. Our brief visit to Germany this spring has left us with intrigued with it's food. We've long loved its beer and I've grown up with several dishes (Sauerbraten, Jägerschnitzel and spaetzle ) but this year we have developed new found love for currywurst. It's the ultimate street food, pork sausage served with a ketchup curry sauce. 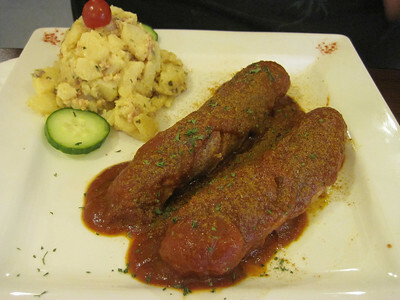 There is a fantastic place in Hollywood called Berlin Currywurst. It left us wishful for a comparable place near home. I heard about Cafe Berlin on the west side near Decatur/215. We recently stopped in for dinner. We were warmly greeted and led to a table for two. 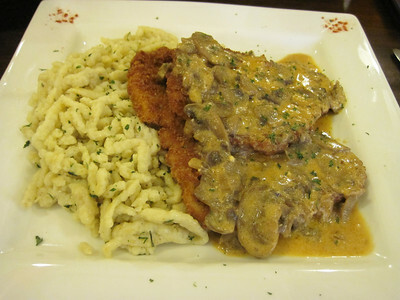 My husband had currywurst with potato salad and I could resist the comfort of Jägerschnitzel and spaetzle. Food was served timely. The currywurst wasn't appealing to the eye, but I couldn't wait to dig into the schnitzel. The schnitzel was delicious. Better then Cafe Heidelberg and world's better than Hofbräuhaus. Tender pork, crisp breading, creamy mushroom sauce. It could've only been better washed down with a full stein. Hopefully, they'll get their liquor license soon. Now, the currywurst, on the other hand, wasn't up to par. The sauce itself was quite good, but the sausage? It was terribly fatty. The texture was very unpleasant. After a few bites we could eat no more. Fortunately, the schnitzel was enough for two. We were bummed we came up empty on the currywurst, but it was nice to find a well prepared schnitzel.